1. Up to 50% wider cutting tooth surface for added stability and truer holes. 2. Chamfered back edge to easily extract the bit from the work. 3. Machine lead screw with burr-free threads that feed the bit through wood at a consistant rate. 4. 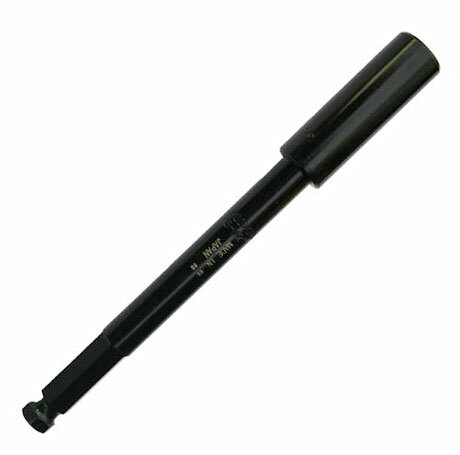 Machined, straight shaft for bit concentricity to eliminate wobble and leave a truer hole. 5. Quick-change shank for fast, secure change-out. Heat treated and hardened for durability. Many professional trade users from electricians to plumbers to general contractors use Self-Feed Wood Boring Bits to quickly bore multiple pipe-sized holes in all types of wood. That’s why WoodOwl bits are designed with precise, hardened cutting edges that hold up cut after cut, with an aggressive self-feed lead screw to help draw the bit into the wood without applying pressure. In addition, the inside cutting plane ensures clean, smooth holes for consistent and even work. Speed of use with a self-feed design and precisely ground cutting edges that guide the bit into the work so the user doesn’t have to. Long bit life ensured by WoodOwl’s tightly controlled heat-treat and hardening processes. 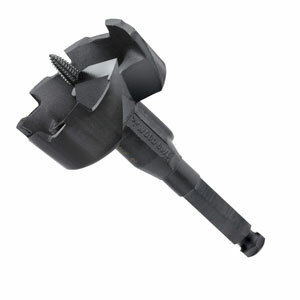 Quick-change 7/16” hex shank for fast bit change-out with secure gripping surfaces in the drill chuck. Two kits designed with the contractor in mind offer the most popular sizes organized in rigid plastic storage cases.